Are you looking for a packaging equipment for your warehouse? Shelf Master has your Solution. We offer Warehouse Packaging Equipment. The Handle-It Low Profile Semi-Automatic Stretch Wrap Machine provides superior film economy (250%), Step-less frequency variation motor, and ease of operation. 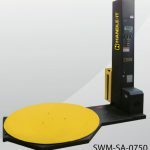 The Handle-It High Duty Cycle Semi-Automatic Turntable Stretch Wrap Machine comes standard with the X-Stretch film carriage that provides superior film economy (250%) film tension and user safety. The Pro-Glide turntable support system is maintenance free and features superior weight capacity. 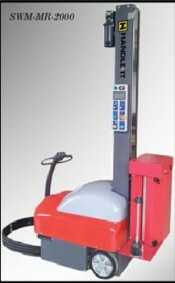 Handle-It® is proud to introduce the SWM-MR-2000 mobile robot semi-auto stretch wrap machine. 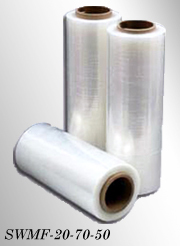 Ideal for wrapping material that is on oddly shaped or sized. 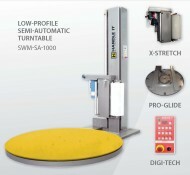 The SWM-MR-2000 offers a simple, durable, and reliable design that allows workers to become more efficient.